This title contains two adorable and gift able books in a durable boxed set. "Baby Bible and Baby Prayers" have already been welcomed as adorable books to share with a very young child. The Bible retells 20 favorite stories very simply, with lots to look at and point to on the page, whilst the book of prayers looks at all the things in a baby's day. Now available in a padded midi format and boxed as a set, they make a delightful gift to give to celebrate a birth or Christening. 'There are several reasons why Sarah Toulmin's "Baby Bible" will be a resounding success. Firstly, it looks the part, with pictures from renowned illustrator Kristina Stephenson adding extra depth and warmth to the characters. Secondly, its narrative of bite-sized Bible chunks makes it easily digestible for children of a young age' - "Church of England" Newspaper. 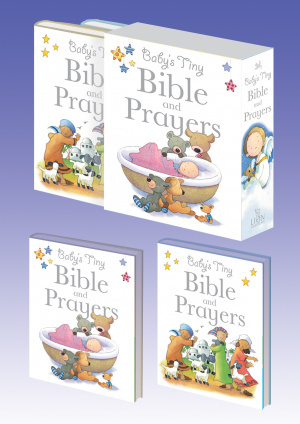 Baby's Tiny Bible and Prayers by Sarah Toulmin was published by Lion Hudson in October 2009 and is our 3100th best seller. The ISBN for Baby's Tiny Bible and Prayers is 9780745962054. Baby Bible and Baby Prayers were originally published separately in 2006 and 2007. Ideal to welcome new baby or as a Christening gift. Publisher. Lion are very good at producing quality gift books and although they have done the children’s bible and prayer book sets before this is a nice addition to the range. It is compact in size but the print is still nice and clear. The illustrations are bright and fun without being too cartoon like as some young children’s books tend to be. Some of the bible stories are a little bit on the short side but overall they are good and my two year old son enjoyed listening to them. I particularly like the prayer book as it is separated into prayers for different occasions and times of the day. At £7.99 it is good value for money and would make an excellent gift. Lion are very good at producing quality gift books and although they have done the children�s bible and prayer book sets before this is a nice addition to the range. It is compact in size but the print is still nice and clear. The illustrations are bright and fun without being too cartoon like as some young children�s books tend to be. At �7.99 it is good value for money and would make an excellent gift. Got a question? No problem! Just click here to ask us about Baby's Tiny Bible and Prayers.